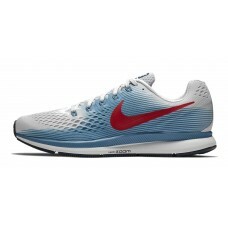 Take to the air in the updated Men’s Nike® Air Zoom Pegasus 34 running shoe. Give strides more glide with Zoom Air units and Cushlon foam providing the rapid response cushioning you crave. Wrap feet with Flywire to hold you secure and comfy while adapting to every move. Keep it airy and light in your Pegasus 34 with an easy-breathing mesh upper and lateral crash rail cushioning your initial ground contact.